This thread is for posting Cooking Workshop Lessons and Ideas for Call of the Disciples. Peter said in reply, “Look, we have left everything and followed you. What then will we have?” Jesus said to them, “Truly I tell you, at the renewal of all things, when the Son of Man is seated on the throne of his glory, you who have followed me will also sit on twelve thrones, judging the twelve tribes of Israel. Please format your posts to make them easy to read. Moderator's Note: This question and discussion originally appeared in our Teachers Help Lounge. You are welcome to add your suggestions to it. I could use some help thinking about a "FOOD" related learning activity for the Jesus Calls the Disciples Cooking/Food Workshop lesson I'm working on. I see in the resource forum an idea for "fish pizza" ...but I don't want to focus on "the fish" symbol because it doesn't convey the central idea I'd like to emphasize, namely: "what does Jesus use to catch/call us?" and "what is he calling/catching you for?" How could you create an Edible Net? Or perhaps the image is a "hook" ? Ideas are swimming in my brain on this one. Jesus' "Call" is not one thing, but many strands in a net tossed our way. The lesson will ask how we are netted How we try to escape the net/call. “Follow me, and I will make you fish for people.” Immediately they left their nets and followed him. I see different color strands of Twizzlers?! 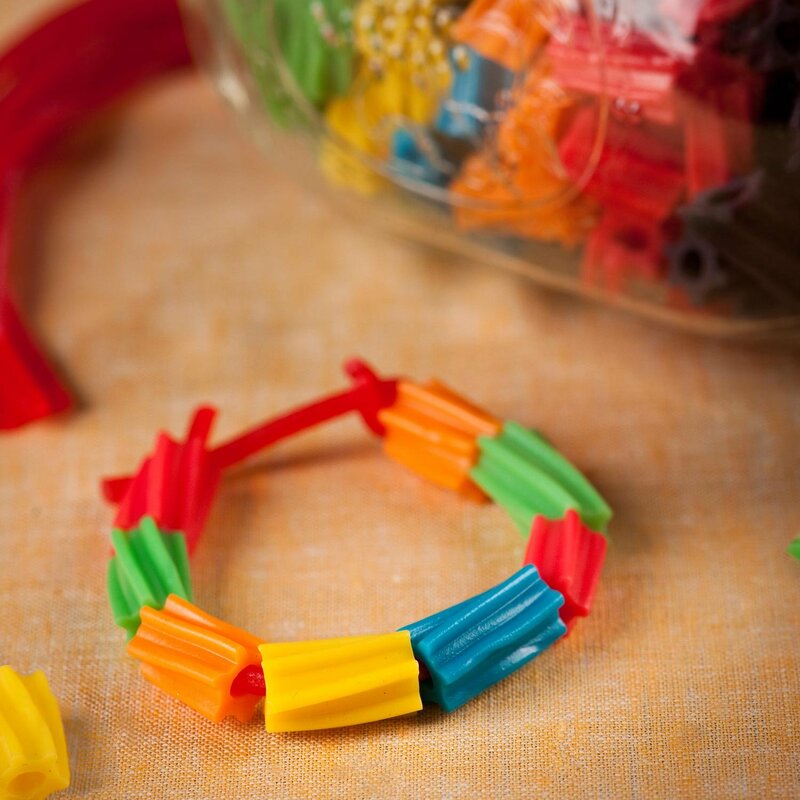 Different colors of gel frosting to top cookies or cupcakes for students to weave into a net? Different colors of waffle batter mix in squeeze bottles to "weave" into a waffle on the iron? Or pancakes on the griddle? We had a chef cook small portions of fish with biscuits, like Jesus may have prepared by the fire on the beach while calling the disciples. The kids actually ate the fish and liked it! He had the kids make a crumb topping out of goldfish crackers...it was probably covered in butter and spices because this in the New Orleans area...but it was delicious! I didn't think the kids would eat it really but I wanted them to try the experience and they surprised me. They loved it and ended up telling lots of fishing stories. When I think of cooking and "catching" things, I think of a colander or a sieve. Wild Ideas . . . . .
Each bucket is filled with the different baits Jesus tosses our way (worship, prayer, scripture, spirit, sunsets, parents, mentors, Sunday School, etc). 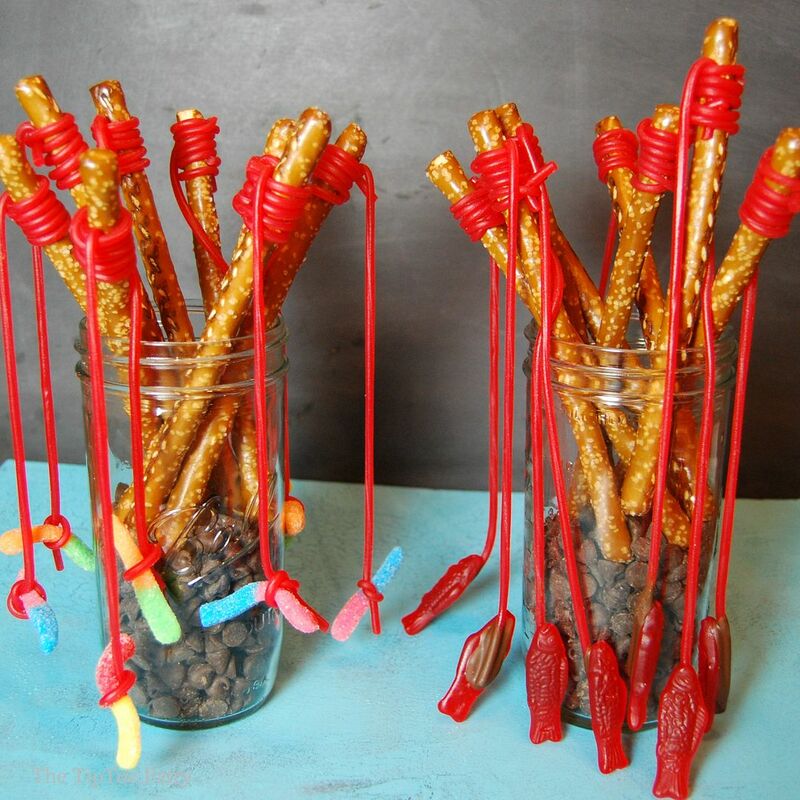 No idea off the top of my head of food could create to represent the different baits. 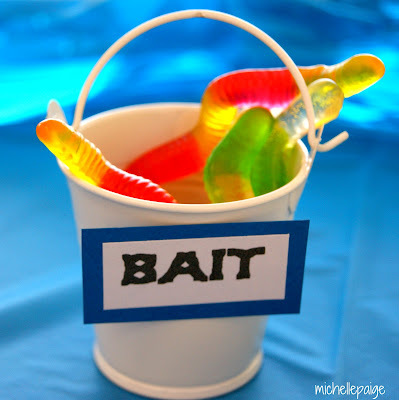 Could break into groups who would be assigned one or two Jesus' bait(s) and once prepared they would be served in labelled Bait Buckets when the groups meet up again to share & discuss. They could also each have an life applilcation lesson activity to do around their bait that they write down things ( maybe on a fish or maybe better still those cardstock paper people - found at educational stores) and at the final meeting table they insert their people into a fishing net hung on the wall by the meeting table.